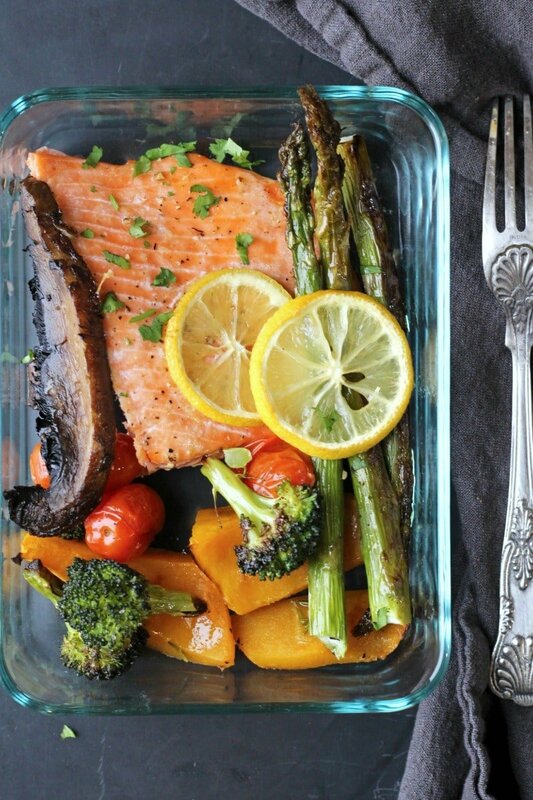 Sheet pan dinner for two with salmon and veggies, low carb complete meal packed with veggies and ready in 20 minutes! Sheet pan dinners are seriously one of the best things ever invented! Although this method of cooking probably has been around for as long as there have been people eating BUT I am glad it’s back because I wouldn’t know what to do without sheet pan dinners any more. Check out this Sheet Pan Roasted Veggies ! It’s easier to clean up. Duh! One thing you never hear anyone say is how much they love washing a sink full of greasy pots. Nope. This saves you a whole lot of clean up to do, and give you more free time to enjoy life. Ultra quick. Having all the veggies and meat spread out in a thin sheet helps cook things up much faster. Eat lean and clean! 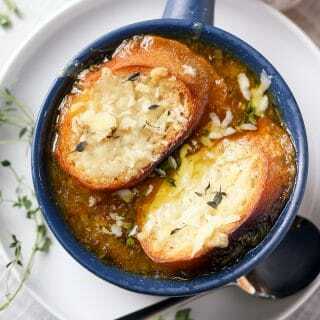 As delicious as saucy dishes are, they are also packed with cream, gravy, and heavy sauces while sheet pan dinners are usually oil based with little spices added to enhance the flavors. So if you are focusing on a low carb and overall healthier diet, this is definitely your best choice! Great cooking method for meal prep. Sometimes the saucy dishes can get too soggy when refrigerated which isn’t always my favorite choice. Sheet pan dinners maintain a great level of freshness which makes for an awesome meal prep choice. 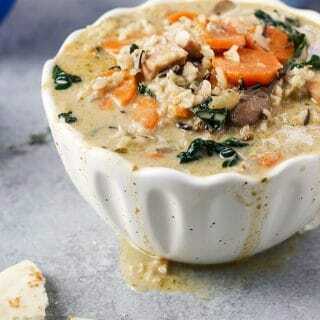 The best way to use up all your veggies. I almost always have sheet pan dinners on Fridays to use up all the left over veggies from the week. This way I can start fresh the next day and prevent food waste. 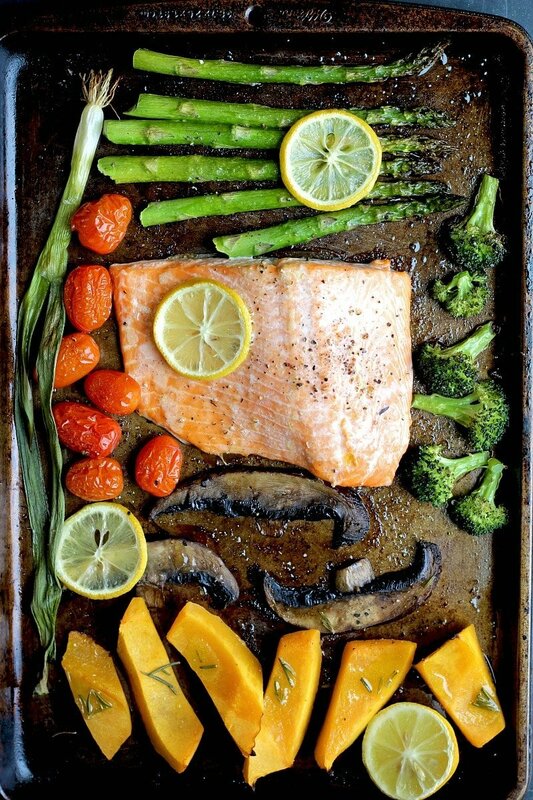 This sheet pan dinner for two with salmon and veggies is just about my favorite because it represents everything that I am currently aiming for in my diet. Luckily Mr. 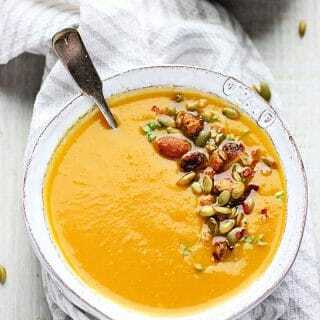 Protein and I are always on the same page when it comes to food, so we are ditching simple carbs (a.k.a pasta, rice) and replacing it with better carbs, such as butternut squashes and sweet potato. And because he is such a ‘greens and protein’ kind of guy, I’ve added not one but two choices of greens as well as something colorful to please my rainbow hungry eyes. 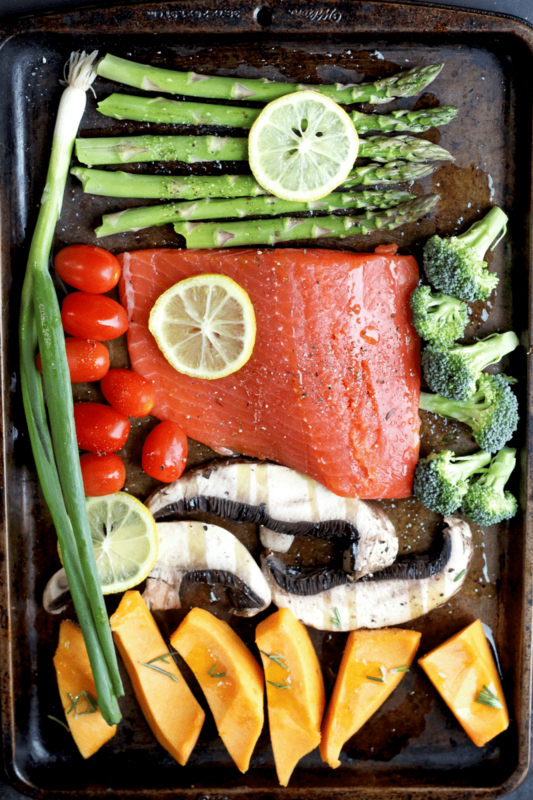 Place the salmon in the center of the baking sheet and all the vegetables around, either mixed or separated (as pictured). Season the salmon and vegetables with oil, salt and pepper. Place lemon slices on the salmon and asparagus and squeeze the juice from what’s left of the lemon. If you wish to add fresh rosemary on the squash, it adds a great flavor otherwise skip it. Not only does this dinner look amazing, that’s such a great idea to use up leftover veggies from the week before they go bad! Thanks for sharing! I love your five reasons defending sheet pan dinners – I had never thought of it as a way to reduce food waste but you’re so right in that it’s the perfect way to use up all the veggies hanging around! Can’t wait to try this! Thanks so much Fiona, I truly appreciate your comment! This looks delicious! 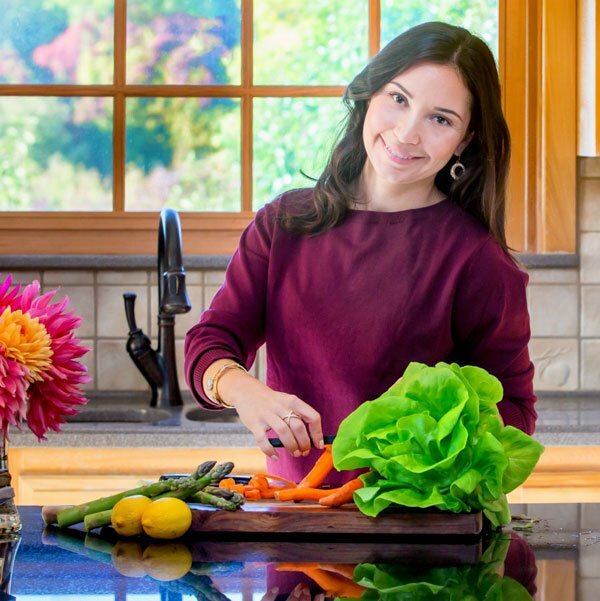 I love a good, healthy meal, that doesn’t cause a ton of dishes! Thanks for sharing! Luci’s Morsels | fashion. food. frivolity. Exactly Luci, its so much easier! I need to take a look at sheet pan, but I don’t think so it’s available in my part of the world. But I read a lot of good things about it. Your post just highlighted again that sheet pan can be very useful. 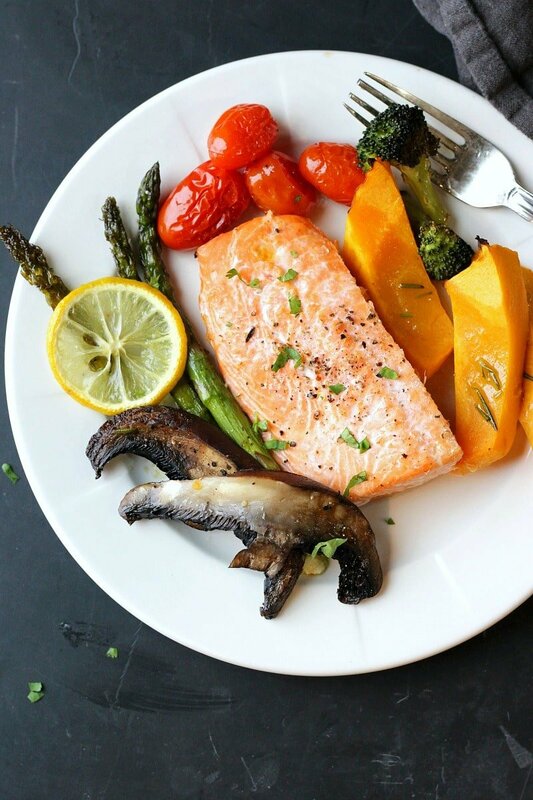 btw I am in love with your veggie and salmon weeknight dinner idea, it loos absolutely amazing. Oh, I really think you will love sheet pan dinners! 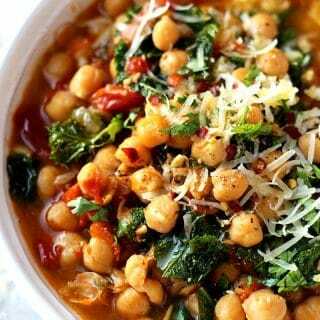 Love such easy and delicious recipes, especially when you want something that is healthy and light too. What a great idea – and so prettily executed!! I bet this tasted very nice, and I’ll be trying it very soon! Asparagus season has just started here, and I love it, as roasting seems to concentrate the flavour. It did taste very good. 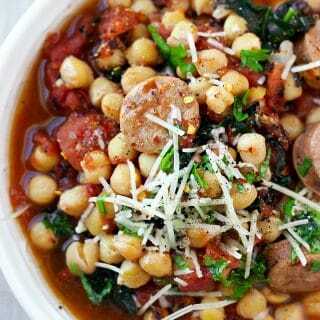 I often make this dish and change the veggies depending on whats available. Hope you do get to try it! This pictures are amazing. 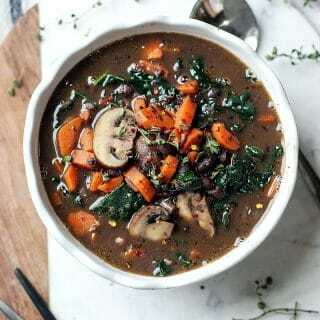 Eagerly waiting fir the weekend to come so i can cook this veggies.